In World War I, county branches of the Red Cross had their own groups of volunteers called Voluntary Aid Detachments (often abbreviated to VAD). Voluntary Aid Detachment members themselves came to be known simply as 'VADs'. Made up of men and women, the VADs carried out a range of voluntary positions including nursing, transport duties, and the organisation of rest stations, working parties and auxiliary hospitals. 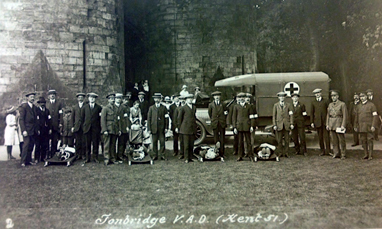 Tonbridge was 'Kent 44' for Quarry Hill House Red Cross Hospital and 'Kent 51' for transport and stretcher bearing. Many of the town firemen and council workers were trained in this regard. Training: At the outbreak of the war, many people were inspired to train to help the sick and wounded. Women needed to be taught first aid, home nursing and hygiene by approved medical practitioners. They also took classes in cookery. Men were trained in first aid in-the-field and stretcher bearing. Talented VADs could take specialist classes to become a masseuse or use an x-ray machine. VADs had to pass exams to receive their first aid and home nursing certificates. 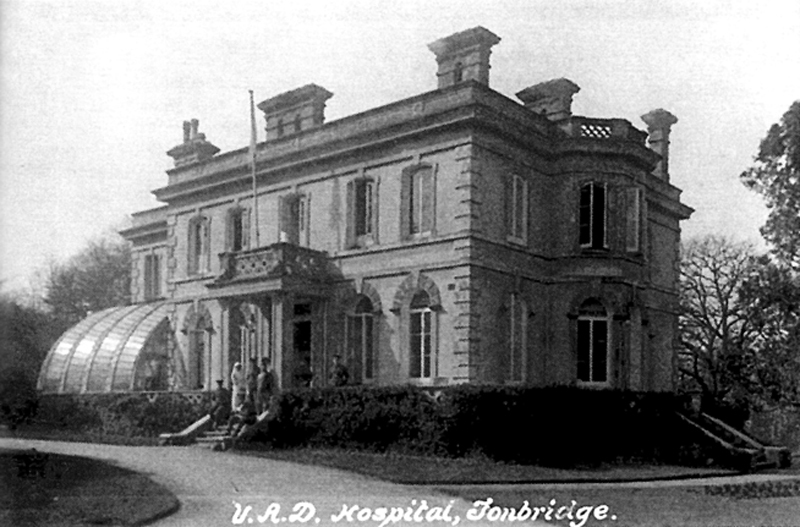 The first list below gives details of 75 women who served at the temporary VAD (Voluntary Aid Detachment) hospital at Quarry Hill House, Quarry Hill Road, Tonbridge, during World War 1. The hospital opened in October 1914 to tend wounded soldiers, and more than 500 men had been treated there by February 2016. It remained in operation until early 1919. Most of the women who worked at Quarry Hill were part-time volunteers. The number of hours which they worked was recorded and is included below where known. A separate list of VAD men follows here. Note: she was the mother of John Waterhouse Children, Rifleman 72167 95th Saskatchewan Rifles – killed in action 15th September 1916. Note: she was the sister of Bertram William Hougham, Captain, Queen’s Own [Royal West Kent Regiment] 3rd Battalion, killed in action 6th September 1918. Note: she was the sister of John Buchanan Kitchin, Captain The Buffs [East Kent Regiment] 6th Battalion, died of wounds, 5th May 1917. Note: she was the mother of Fleming Newton, 2nd Lieutenant Royal Air Force, killed in action, 9th May 1918. Note: Probably a relative of Michael Topham, 2nd Lieutenant Royal Flying Corps, 27th Squadron, killed in action on 13th April 1917. His father, Francis David Topham, was living at 42, Hadlow Road, when he applied for Michael’s medals in 1920. Note: mother of Margaret Bowman Waite, who served in the First Aid Nursing Yeomanry, and who was decorated for bravery with the Belgian Order of Leopold II for her part, with two other nurses, in tending to wounded men in the front line trenches, under shell fire, and ensuring their safe evacuation. Note: she was the sister of James Hoste Welldon, 2nd Lieutenant East Kent Regiment, killed in action on 30th November 1917. Served at Quarry Hill from Quarry Hill from 5th October 1916 until 3rd May 1917 - 2 days on duty, 2 days off, continuously - full time nurse. Male detachments were almost entirely in charge of transporting sick and wounded soldiers from ambulance trains or ships to local hospitals. They also ferried patients between hospitals. Male volunteers were also frequently sent to France to work as ambulance drivers, often coming under fire as they transported men away from the Front. James Adams of 13, High Street Tonbridge served from 26th October 1914 until 28th February 1919 at Kent 74, Bidborough Court Hospital, Neville Park, Tunbridge Wells. He served full time as an Orderly. He was born at Capel on January 3rd 1867. In 1911, he and his wife Alice [Bridges] and their three children were living at 50, Lavender Hill, Tonbridge. He was employed as a sewage tank attendant by Tonbridge Urban District Council and died on 20th October 1944 at Tonbridge. George Batchelor of 71, Barden Road, Tonbridge, served from October 1914 and was still serving in 1919 he was a Section Leader & Ambulance Orderly and had charge of one ambulance. He served part time and achieved 10,200 hrs. He achieved the rank of Sgt in Field Ambulance Transport R. and C. 2 in Kent 51.He was born in 1863 at Tonbridge, a son of William and Sarah Batchelor. In 1911, he was living at 169, Vale Road, Tonbridge, with his wife, Charity [Cane], and five children, three others having left home. He was employed as a drain layer for Tonbridge Urban District Counciland died in 1933 at Maidstone. He also served as a fireman. Fred Boyde was born in 1868 at Basingstoke, Hampshire. He came to Tonbridge from London, where he had been serving in the Metropolitan Fire Brigade, with his wife, Marie and two children, at some point in the early 1900s. He was recorded as the second officer at Tonbridge, living at the Fire Station, 8, Castle Street, Tonbridge in the 1911 census. He served part time with the Red Cross from 10/1914 and was still serving in 1919. He became the Deputy Transport Officer and achieved 10,200 hrs with 2 M. Sug Field Amb Transport R.A.S.C. M T (V) Kent 51. William Laurence Bradley of "Rylstone",The Drive, Tonbridge & The Castle, Tonbridge, served part time from October 1914 and was still serving in 1919. He held the rank of Commandant & Aux Transport officer. His duties included Commandant & Aux Transport officer o/c Field Aux Transport Tonbridge & Tunbridge Wells. He achieved 10,200 hrs, Kent 51. He was born in Skipton, Yorkshire on 28th September 1862. He moved to Tonbridge in the 1880s with his wife and four children and, at that date, he was employed as an auctioneer’s clerk. By the time of the 1891 census he had become a civil engineer and surveyor. In 1911 he was employed as a surveyor by Tonbridge Urban District Council. Sometime after that he was appointed as the Chief Officer of Tonbridge Fire Brigade until he was succeeded by Chief Officer Gabriel and then Chief Officer Ives. When Ives was called up, Bradley again took up the duties of Chief Officer. He died on 25th March 1939 at Tonbridge. Friend Bristow of 7 East Street Tonbridge joined the Red Cross age 34 and served from 23rd September 1914 until 23rd March 1915 as an Orderly being paid at 30/- per week. He was part of a contingent of fireman from Tonbridge who served in France. He later was awarded the 1914 Star in December 1919 by the Chairman of TUDC. He was also awarded the British War and Victory Medals. He born in 1880 at Tonbridge and was married with four children and, in 1911, was employed as a bricklayer. Charles Butler of 21 Gladstone Road Tonbridge was 24 years old when he joined the Red Cross in 21st October 1914, leaving his role as Fireman and served until 31/8/1919 at No. 1 M.A.C. Boulogne. He was initially an Orderly but then a mechanic being paid 1/5½ d. per hour. He was awarded the 1914 star by the chairman of TUDC in December 1919. He was born in 1890 at Tonbridge. In 1911 he was working as a fitter at “Explosive Works” – Powder Mills presumably – and living with his parents at 2, Alexandra Road, Tonbridge. The following year, on 3rd August 1912, he married Alice Kerwin at Tonbridge Wesleyan Chapel. He died on 20th February 1964 at Tonbridge. He also served as a fireman. William Clarke of "Sunnyside" Hildenborough, Tonbridge served from September 1916 and was still serving in 1919. He volunteered for Red Cross Society and served here and occasionally in France. He was a Section Leader & Ambulance Orderly from August 1915, leaving his role as a fireman. He was part time achieving 2000 hours, and was presented with his medal by the chairman of TUDC. Alfred Edmund Cornell of Woodfield Road, Tonbridge served from October 1914 and was still serving in 1919. He was an Ambulance driver & care of same and orderly part time, achieving 10,200 hrs and Corporal in Field Ambulance Transport R.A.S.E M.T. Kent 51. He was born at Tonbridge in 1882 and died at Tonbridge in 1943. He worked as a watchmaker in the family business run by his father, Alfred Cornell. Aaron Foster of 168 Vale Roa Tonbridge served from July 1015 and was still serving in 1919 as an ambulance orderly part time, achieving 1000 hrs in Kent 51. He was born, a son of Thomas and Harriet Foster, in Tonbridge in 1895. In 1911, he was employed as a stable boy at a Preparatory School in Sevenoaks. He enlisted as Private 1049 in the Royal West Kent Regiment on 3rd September 1914 and served at various times with the 3rd, 9th, and 7th Battalions. He was discharged with the rank of Lance Corporal as medically unfit, suffering from hepatitis incurred as a result of active service, on 11th October 1916. David Llewellyn Francis of Green Trees, Hadlow, near Tonbridge, Kent joined age 41 as a driver of a motor ambulance serving in Boulogne from March 1915 until September 1915. In 1911, he was a widower living with his mother, Mary Eliza, and step-father, Robert Laidlaw, at Warren House, Hayes, Kent. He had previously worked as a tea planter in India, but by 1915 he was living at Hadlow and working as a farmer at Goblands Farm. He died on 16th May 1931 at Green Trees, Tonbridge. Herbert Cecil Groves of 98 Hadlow Road, Tonbridge joined as a clerk age 26 on 26th January 1917, serving until 29th March 1919 at Netley Red Cross Hospital. He was born in 1891 at East Peckham, a son of Herbert William and Emily [Stevens] Groves. In 1911, he was living with his parents and younger brother at High Street, Hadlow and employed as an apprentice printer. He died on 16th September 1960 at Tonbridge. Herbert George Gunner of 97 High Street, Tonbridge joined age 36 years on 22/01/1917 to 10/02/1919 as a Stores Clerk, serving at B.R.C. Hospital, Netley, and then B.R.C Stores, in charge of store Pall Mall, from 20th August 1917 until demobilisation. He was born in 1882 at Tonbridge, a son of George Turk Gunner and his wife, Frances Sarah Weller. In 1911, he was living at 97 -101, High Street, Tonbridge, with his wife, Edith May [Robertson], and their son. He was the manager and buyer of the well-known Gunner’s general drapery shop at that address. He died in 1972 at Tonbridge. Frederick George Hosier of Lavender Hill Tonbridge joined the Red Cross on 25th October 1914 when he was 42. He served until 23rd July 1915 as an orderly in France leaving his occupation as a fireman. He was born at Uxbridge, Middlesex in in 1870. He had previously lived at Penshurst before moving to Tonbridge at some point in the 1890s. Before the war he worked as a plumber in the employ of the Railway. He married Ada Wilkinson in June 1895 at March, Cambridgeshire. He died on 1st July 1952 at East Grinstead Hospital. Albert Humphrey of High Street, Hadlow joined age 20 Boulogne S.S.A.7 as a Driver from 22/10/1916 serving until 27th February 1917. He was born in 1898 at Hadlow, a son of Henry and Sarah Jane Humphrey. In 1911 the family were living at High Street, Hadlow, and Albert was still at school. He seems to have served initially with the A.S.C. before seeing service with the Red Cross. His Medal Card gives his rank as Private and his Army number as: S4/094837. William Ingrams ofShipbourne Rd, Hildenborough, Kent joined the Red Cross age 22 as a fireman on 23rd September 1914 and served in France until 10th February 1919 He was born in 1892 at Hildenborough, a son of Louis and Henrietta [Card] Ingrams. In 1911, he was living with his parents at Shipbourne Road and working alongside his father as a cricket ball maker. Henry James Martin of 6 Castle View, The Slade, Tonbridge was age 43 when he joined the Red Cross having served as a fireman at Tonbridge. He joined on 23rd October 1914 and served as in France until 23rd July 1915 as an ambulance orderly. He was born at Wateringbury, Kent in 1869, the son of Henry and Caroline [May] Martin. He, his wife Ellen, and two daughters were living at 6, The Slade in 1911, and Henry was employed as a carter by Tonbridge Urban District Council; he had previously worked as a brewer’s drayman. Thomas Russell of Waterloo Place, Tonbridge served from October 1914 and was still serving in 1919 as an orderly part time achieving 1000 hrs in Kent 51 having served as a fireman. He was possibly the Thomas Arthur Russell, born 1870 at Tonbridge, who in 1911 was living with his wife Ellen and two children at 25, Woodside Road, Tonbridge, and employed as a carpenter in the building trade. William C. F. Waghorn of Avebury Avenue Tonbridge served from October 1914 and was still serving in 1919 as an orderly as part time achieving 1000 hrs as Private in Field Ambulance Transport RAMC MT (X). He was born in Tonbridge in 1878 and in 1911 he was living with his wife, Lillian Melissa [Golding] and their daughter at 3, Avebury Avenue. William’s occupation was a smith & farrier, as well as a fireman.